With coalition talks stalled between Likud-Beytenu and Yesh Atid, PM Binyamin Netanyahu warns Yair Lapid that time has run out. With coalition talks between Likud-Beytenu and Yesh Atid stalled -- primarily over the issue of who gets the Education portfolio -- Prime Minister Binyamin Netanyahu has finally warned Yair Lapid that time has run out. Lapid hosted Bayit Yehudi chairman MK Naftali Bennett in his Tel Aviv home Wednesday afternoon, to discuss the crisis. Earlier Wednesday, Bennett met with Netanyahu in a last-ditch effort to break the deadlock. 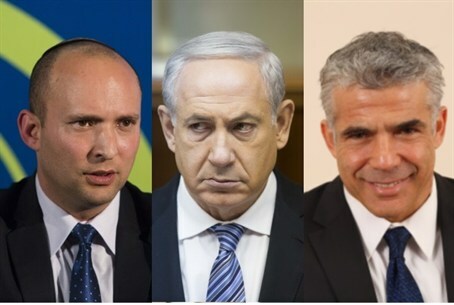 Likud sources told reporters that if Yair Lapid could not find a way to compromise on what they called “excessive demands,” then Netanyahu would approach the hareidi-religious parties instead to negotiate their entry into the coalition. An official from the hareidi-religious Sephardic Shas party, however, told reporters there was "no chance" the party would enter the government under such circumstances. A hareidi-religious source in Jerusalem told Arutz Sheva on Wednesday afternoon, "It is impossible at this point to really predict where this is going to go. There are a lot of things going on in the background that are not being discussed publicly, obviously. But either way, it will all be over in a few more days." The source added that despite the party's strong reluctance and "bruised feelings," there was still a slight chance that Shas might be persuaded to join a Netanyahu coalition "if conditions were right." The insistence of Yesh Atid to have the education portfolio, the source said in a statement, “comes from the fact that the way to change the face of this country passes mainly through this ministry. "Yesh Atid being accused of extortion is a distortion of truth. Yesh Atid has agreed to reduce the number of portfolios in its own party in order to reduce the number of minister in the government. Yesh Atid asked voters to trust in the party not only to fight the size of the government and equality of burden, but also on education and the future of the Israeli society. "In this matter Yair Lapid will not stray from his principles and promises even if he has to sit in the opposition," the source added.